When western anglers are asked from time to time to rank their favorite game fish, the poll results are invariably the same. It’s rainbow trout and walleye that occupy the top spots. All other angling species must take a very distant back seat and for good reason. Provincial governments go out of their way to stock thousands of rainbows each spring making them readily available in ponds, lakes and reservoirs virtually everywhere. Fisheries managers have worked diligently to restore and enhance walleye populations through harvest restrictions, spawning protection closures and restoration through stocking. So instead of trailering to some remote Canadian shield lake to find cosmic walleye action, Old Walter has become available in abundance within easy access of large population centres and nobody knows that more than walleye anglers from Alberta’s capital city. Because, as unlikely as it sounds, Edmonton may very easily claim the title of Walleye Town with four prime fisheries and a developing fifth within an hour’s drive of a million people. Here’s a rundown of the capital’s walleye hotspots and some timely tips on how to hook them. Pigeon Lake is a cottage country waterbody southwest of town with a long and troubled history. Twice it had its walleye extirpated by over-harvest and commercial netting incidental catch. So when biologists tried one last time to bring the ‘eyes back in the late 1990s it was done not with a lot of confidence. But despite the odds, the millions of walleye fry that were released in the lake took hold. Within a few years anglers reported aggressive little walleye showing up. The lake has never looked back despite noisy protests from the lake’s traditional whitefish anglers who observed that the whites had abandoned their shallow water haunts during the spring ice season with the arrival of a new and aggressive predator. Now walleye are the primary target for recreational anglers and for good reason. Triple figure days are not out of the question. The famous provincial park drop-off may rank as the most heavily fished piece of structure in the province and that’s obviously because it’s that productive. It was late summer and Pigeon was beginning to show the ill effects of being surrounded by urban development and a close-ended drainage system. There was a troubling algae bloom and angling prospects didn’t look promising. But sometimes beauty is more than skin deep. Instead of the drop-off, where a small flotilla was already anchored up, my fishing partner Emmerson and I motored to another enticing piece of Pigeon Lake structure - the Grandview Hump. This underwater flat a couple hundred metres off the summer village on the south shore is renowned for its walleye holding properties. When the Lowrance began recording a rise in the lake bottom, we backed off in about 15 feet of water where the fish finder was no longer indicating bottom vegetation and set the anchor. There are probably as many ways to angle for walleye as there are anglers. From using 8-weight fly rods and streamers to elaborate crank baits and trolling techniques but we chose the old school way of catching them. A tub of medium-sized frozen shiner minnows threaded on a chartreuse jig head. This rig can either be cast with a spinning rod and reel set-up, allowed to sink to the bottom, then brought back in a pop-and-stop retrieve or simply dropped over the side of the boat until the line goes slack, indicating the bottom has been reached. Then lifted a foot or so with a rotation or two of the reel so the bait is suspended above the substrate, but still in the walleye zone. After that simply wait for the tap. It didn’t take long in coming with Emmerson, and we were very soon into fish. It stayed that way all afternoon. Unlike pike, which more time than not rush their prey and bite hard and unfortunately end up with the lure very deep - making safe catch and release sometimes problematic. With pike you do need a good set of jaw spreaders and a long hook extractor, while the walleye bite is far more subtle. Sometimes so light that you almost need a sixth sense to feel it. It also requires a lot of patience and will-power not to set the hook too soon. Allow the fish to fully mouth the bait before pulling the trigger or a lot of jigs will come back with nothing but a shiner head attached to the hook. A shock tippet is not needed for walleye angling. Unless they share the waters with toothy pike. In that case a foot or so of coated wire or the new braided tippet material can be attached to your line. I’ve also had increased success after replacing the monofilament and loading my walleye reel with braided nylon. Mono has too much memory for my liking. My angling "feel" has improved exponentially since the switch. So have my hook-ups. Of course, for many walleye anglers, it’s all about eating. The tradeoff is, if anglers fry all the fish, there soon won’t be any around to catch. 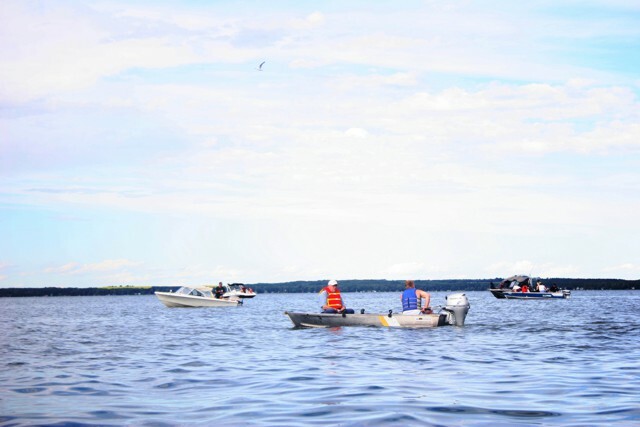 Because of angler pressure Pigeon Lake does have a restricted harvest where anglers apply for tags in three size ranges that are distributed through a spring draw. When the time came to put the boat back on the trailer, we’d probably boated 100 walleye. And on a day when our prospects didn’t look too great, it doesn’t get much better than that. Lac Ste Anne is a big lake northwest of town with a great history. Its super-abundant shoals with lake whitefish once fed the inhabitants of Fort Edmonton. The lake is also the home of a long-standing pilgrimage where First Nations people cure their ills and restore their faith in Ste. Anne’s sacred waters on the site of Father Albert Lacombe’s famous mission. There’s even supposed to be a canoe-smashing Manitou cruising its depths. But today Lac Ste. Anne is all about walleye. 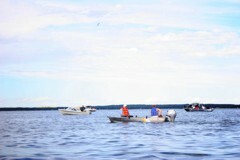 Again the lake’s now-thriving walleye populations are the result of another rescue mission by provincial biologists. The fish numbers were nurtured back to health through a harvest closure and the results have been nothing short of spectacular. As I found out on a summer excursion to Lac Ste. Anne and the mid-lake mound opposite the river lot settlement and mission. Again after locating the fish-holding structure on the sonar, then backing off until the screen no longer showed bottom clutter. After that the fishing was dead easy with strikes coming both by stop-and-go retrieving or suspending the frozen minnow bait. We even broke out the fly rods for a spell. Later we used our map of the lake bottom to locate a concentration of contour lines along a section of the north shore which indicated a drop off. Walleye love hanging out where the lake bottom deepens dramatically and this one was no exception. The action may even have been better than on the Mission Mound and produced another high double-figure day. Lac Ste. Anne also has a restricted harvest available through the spring tag draw. The Walleye Town sleeper fishery is Battle. It’s also the most picturesque lake nestled in a largely undisturbed wooded valley with a stoic butte standing sentinel at its northwest end. While only a short drive further down Highway 13 from Pigeon Lake, Battle seems like a million miles away from the hustle, bustle and competing user groups that appear many days at the big, nearby cottage lake. It was toward the butte where we pointed the boat one early-summer evening, in search of what Battle Lake is becoming known for. Big, hard-fighting walleye. We had already entertained ourselves thoroughly catching too many fish to count - including many feisty pike. 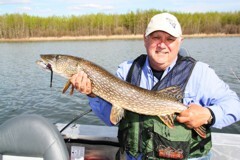 Although like many Alberta lakes where there are competing predator species, the Battle pike are mostly on the small side. But they clearly punch above their weight when hooked on light spinning or fly tackle. At the butte we anchored in 20 feet of water which the fish finder revealed sloped away sharply. Then lowered our jigs and minnows to the bottom and held on. It didn’t take long for the walleye to find our baits. The action was steady and sometimes spectacular in a lake that is thankfully now protected with zero harvest which allows the walleye to grow big. As well as Walleye Town another alter ego for Alberta’s capital is River City. For no other reason than the fact that a big, sprawling river runs through it. The North Saskatchewan River once had the unfortunate public perception as a heavily polluted waterway. And when it’s roiled with gray glacier-melt or run-off after the early summer rains, it’s not particularly attractive. But when the floods subside and the NSR returns to mid-summer levels, it takes on a gorgeous green hue and is absolutely sublime. During the fall foliage season it’s even better. It’s also full of walleye. Not just in some remote, upriver eddy, but right in the heart of the city. Although you’d never know it because as soon as you clear the Quesnell Bridge on an up-stream trip, the wilderness takes over and the river turns primitive. Here there are current breaks, glides and backwaters that attract and hold walleye. Look for water 6 to 8 feet deep and anchor where the slow and rapid flows intersect with a distinct line running down it known to anglers as the "seam". The technique is to use a heavily-weighted jig baited with a frozen shiner to find the bottom despite the current. Then slowly bring it in with a stop-and-pop retrieve. The hit will likely come when the jig is brought in motion. Impressive multi-fish days are easily attainable without ever having to leave the city limits. Maximum access requires a boat. But not any boat. The North Saskatchewan is swift and surprisingly shallow in places with expansive rock gardens. A standard propeller-powered fishing boat is simply a recipe for a bent prop. A jet boat is the way to safely access the river. Floating the river with a drift boat or pontoon is a viable alternative. Bank angling is also a good way to catch walleye. Again fish the eddies, storm sewer outfalls and current breaks but also be aware that the unstable riverbanks contain boot-sucking seams of bentonite clay and caution should be taken when placing your feet. This large waterbody west on the Yellowhead Highway is still a work in progress after 6.5 million walleye fry were released in 2011. These fish are now showing up in impressive numbers and Alberta Environment and Parks appears to be headed for another Walleye Town success story. If it wasn’t for the detrimental effect their interlopers are having on the lake’s once-impressive pike population. After a consumption ban was slapped on Wabamun following Canadian National Railway’s tragic toxic oil spill in 2005, followed by a zero harvest regulation, the pike grew exponentially. Now they are undersized and apparently undernourished and this special trophy fishery, unfortunately, appears to be a fading memory to hopefully be replaced by another thriving fishery in and around that place called Walleye Town.